This book packs 1162 pages of Power! 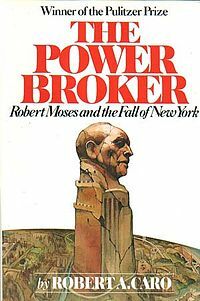 It tells the story of Robert Moses, the single most powerful man in the United States during the twentieth century. He changed the landscape of the greatest American City. He built bridges, beaches, dams, parkways, and many notable buildings like Lincoln Center for the Performing Arts, Shea Stadium, United Nations Headquarters, New York Coliseum and the Worlds's Fair. His power base was New York City where he formed powerful alliances that brought Governors and Mayors to their knees. He brought his causes to the people. In a crusade to build the beaches on Long Island, he went beyond the law and seized coveted property. He pitted park supporters against park deniers, wealth against lack of wealth, privilege against impotence, influence against helplessness, and the rich golfers against the sweating masses of the cities. Against all odds, he succeed. A lesson in power, "The important thing is to get things done." Ironically, Moses fought the publication of this book. Thankfully, he didn't win this battle. I found this interesting video created by onecent81 about Robert Caro. it provides unique insight into the writer's life and his relationship with his publisher. The popularity over the years of The Power Broker subsidized Caro's writing of the LBJ series: The Path to Power, Means of Ascent, Master of the Senate and The Passage of Power.